While waiting for the second clue in the Mystery scarf project, I began the socks using the Hazel Knits yarn that came with this month’s shipment. The pattern is called Boreal. 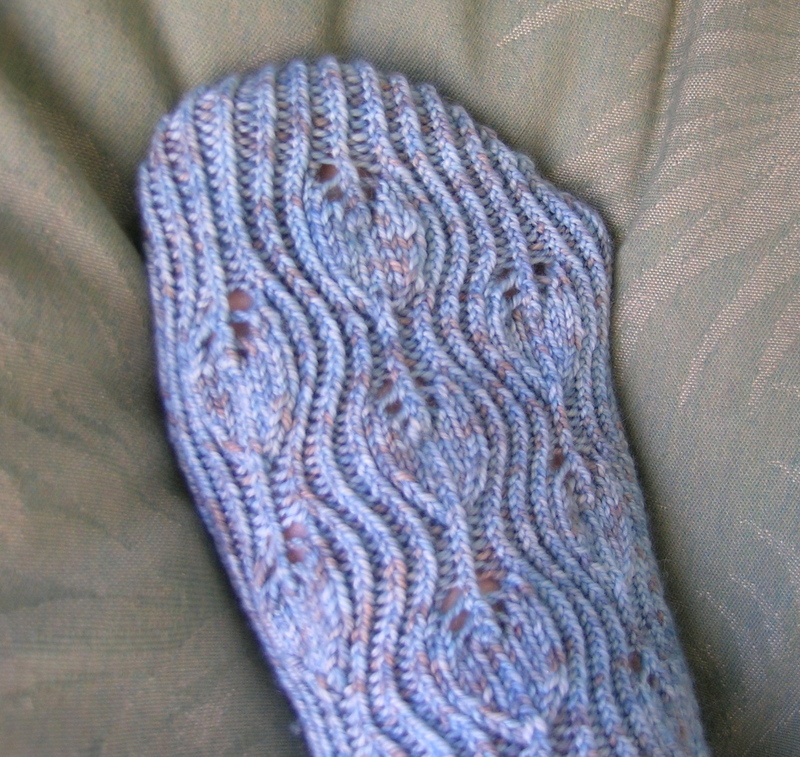 It is a toe-up sock, not usually my favorite. I have not found a good way to make a heel work for a high instep, and I find it more difficult to know where to start the heel. On a top-down sock I knit until my toes start, then work the toe section, and I can easily try it on for fit. 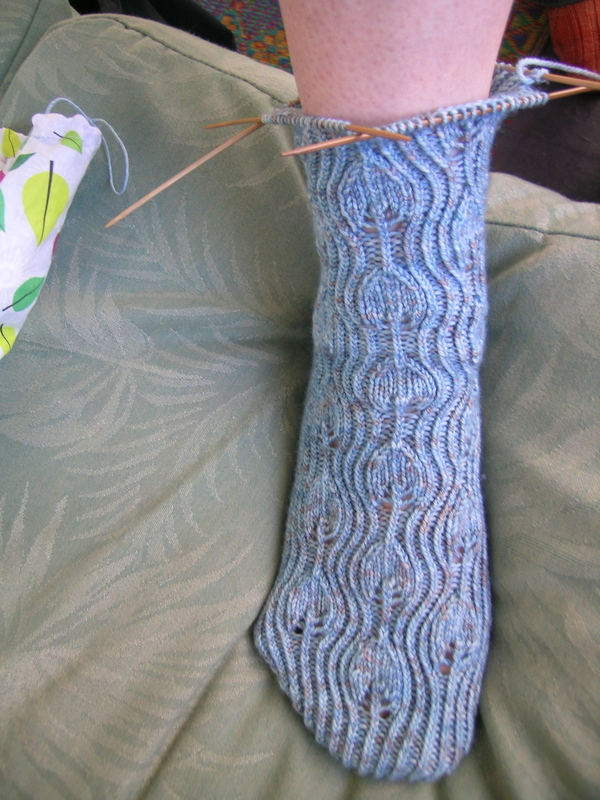 When trying on the toe-up sock, you have to be much more careful, as you are pulling up the end with the live stitches on the needle over your foot. 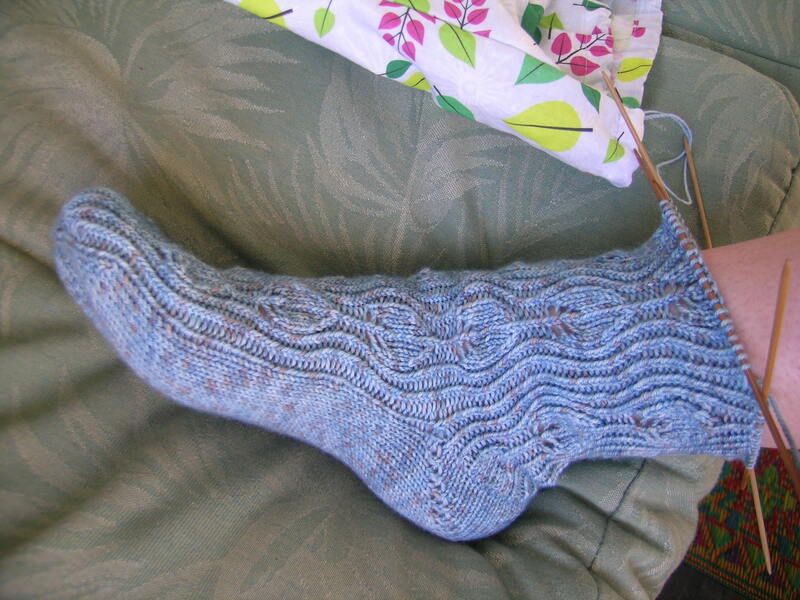 This pattern has proven to be very stretchy and accommodating for different sized feet, even with the short row heel. After I got the increases finished on the toe, it was also an easy-to-remember repeat pattern, so I could take them along with me and knit little bits at a time (the pattern looks like little tadpoles swimming to me). I have stopped on the first sock, and am going to knit the other sock from the opposite end of the skein of yarn, that will allow me to use all of the yarn and make them higher, the great advantage to toe-up socks. This yarn is really soft and very nice to knit with. My husband has a pair of socks from this vendor that I made him last year. He says that they are his favorite socks, but I have noticed a lot of pilling on them. Love this pattern! Where’dya get it? It is from the Knitterati Sock Club by Janel Laidman. There is still the option to purchase just the patterns here, yarn packages are all sold out.